'Diagram of Natural Phenomena', c 1850. Geological diagram showing the principal causes of geological changes on the Earth's surface, identified by a key beneath the illustration. 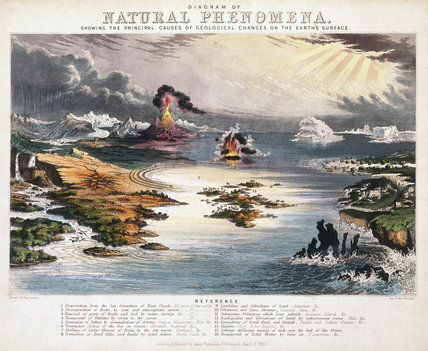 One of a selection of 44 scientific teaching diagrams, drawn and engraved by John Emslie on geology, geography, astronomy and natural philosophy. This hand-coloured engraved plate is taken from a series published and probably written by James Reynolds of 174 Strand in London in 1850-1860 in response to the popular demand for information on the developments taking place in science and engineering as a result of the Industrial Revolution. Superbly illustrated images with a related text were presented loose in a portfolio so that they could be pased around a clas or lecture room or used as posters. 'Comparative magnitudes of the planets', c 1851. 'Comets and aerolites (Meteors)', c 1851. 'Phenomena of Volcanoes and Earthquakes', 1852. Physical map of the British Isles and the surrounding seas', 1851. 'Geological Map of England', 1849.